My feet have not been happy lately. Their life to date has been spent schlepping around in cheap shoes offering little support and The Feet decided that in their middle age they’d appreciate some better quality footwear with decent arch support and, most importantly in their opinion, lots of cushioning. I thought The Feet would like some walking shoes, so I researched the recommended brands and styles and we set off for the store with some specific shoes in mind. The Feet tried on three pairs. The first pair was a definite no, but the next two felt quite good so The Feet walked back and forth in the store, humming and hawing, trying first one pair of shoes and then the other, until they finally chose a pair. At home they wore the shoes around the house, back and forth, humming and hawing, until they deemed the shoes comfortable enough to wear outside. The first day out they wore the shoes for about three hours and that was enough to change their minds. So those shoes were returned to the store and, at a different location, The Feet tried on more pairs, choosing highly cushioned running shoes this time. The first two pairs were a definite no, but upon trying the third pair Left Foot said “Wow, this is great! This is like walking on air!” Right Foot was a little doubtful. “My sole loves it, but it’s a tiny bit tight across my toes; I don’t know if it will stretch.” Left Foot groaned impatiently, “But I love this shoe!” So we brought the shoes home and The Feet wore them around the house, back and forth, humming and hawing, until Right Foot said “No, it’s no good, it’s too tight.” “Big Lout!” complained Left Foot. “Runt!” grumbled Right Foot. So I added some heel cushions and The Feet wore the shoes around the house, back and forth, humming and hawing, until Right Foot said “My shoe feels good.” “Mine does too!” agreed Left Foot. And finally, everybody was happy. 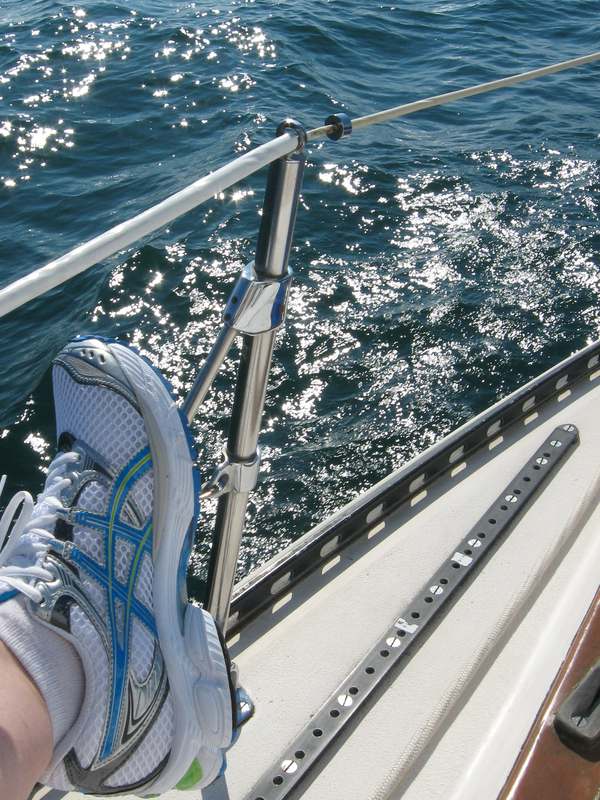 Left Shoe enjoying its first time out on the boat.